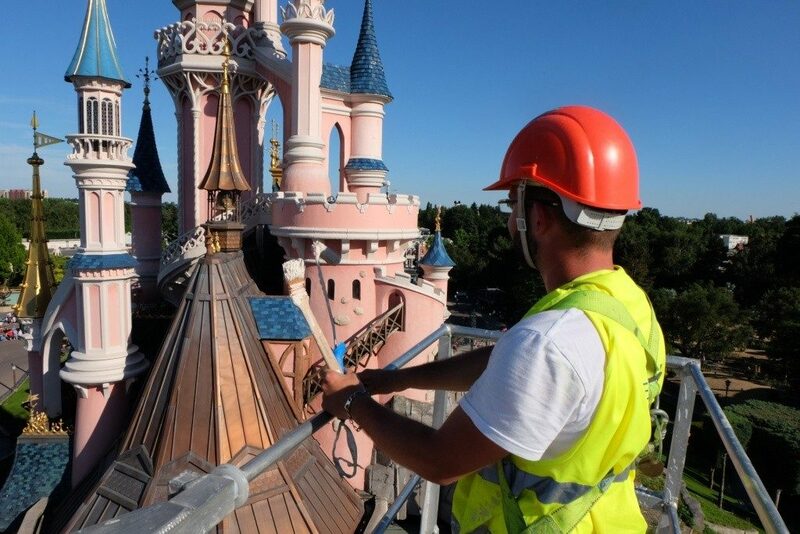 For guests who have visited Disneyland Paris in the last few weeks have seen it already; Sleeping Beauty’s Castle is receiving a new layer of paint. While the park is getting ready for the 25th Anniversary, the main tower will be restored to the original color design whereas the rest of the façades, the golden spires and the tiles will also be given a brush-up. The last time the castle was repainted was for the 20th Anniversary in 2012. Sleeping Beauty’s Castle’s stone bridge will be cleaned and repaired. During the works, the outside terrace is closed, whereas Sleeping Beauty’s Castle Gallery remain closed to guests. “The big challenge for this painting project is that we are dependent on the weather and the nightly show on the castle. We have a very short time window to work each day” explains François Gamas.